Mannarasala Sree Nagaraja Temple is a very ancient and internationally-known centre of pilgrimage for the devotees of serpent gods. One of the rarest temples in the world where serpent deities are worshipped, particularly by woman priests. A fine example of eco-friendly existence. The Mannarashala temple is located about three kilometers to the south-east of the bus station in N.H.47 at Haripad, in Alleppey district of Kerala. Haripad, a culturally renowned ancient town with prominent role in the history of Central Travancore, is rich with its exquisite green paddy fields, towering coconut palms and serene atmosphere of the adjacent hamlets. Now Haripad is a well-developed town with enough civic infrastructures like shopping complexes, hotels & lodges, educational institutions and hospitals. The ancient Subrahmanya Swamy Temple in Haripad, which is one of the renowned Subrahmanya temples of Kerala and a testimonial to the glory of the great Kerala temple architecture, is located on the way to the Mannarasala temple. Proper signboards are available from the N.H.47 to the temple. Since the temple is very renowned, accessibility to the temple may not be a problem for the devotees. Various cabs and auto rickshaws are available near the Haripad bus station and Railway station to reach Mannarasala at nominal fare. Since located near the highway almost equidistant between the cities of Thiruvananthapuram and Kochi (approx.113 kms and 103 kms respectively), it is easy to reach Haripad via bus and train. Though the legends related to the origin of a place cannot be deemed as its history, the story on the evolution of Mannarasala as the supreme place of worship of the serpent Gods is associated with Parasurama, the creator of Kerala. The history of Mannarasala has been mentioned in the 'Mandara Salodayam' Sanskrit poem written by Mannarasala M.G.Narayanan Nampoodiri of the sacred family, who wrote it on the basis of reliable accounts and legends traditionally handed down and in the light of old books available with the temple. Since the poem was incomplete, the history narrated here is from the book 'The Serpent Temple Mannarasala', published by Mr.N.Jayadevan of Manasa Publications (Translated to English by the renowned scholar Dr.Ayyappa Panikker). This book is also based on the advice and instructions received from the former Great Mother, and in accordance with the other members of the family as well as the old records examined for the purpose. Sree Parasurama decided to seek release from the sin of killing the Kshathrias. He approached the holy Rishis. They suggested that he should make a gift of a land of his own to the Brahmins. Parasurama, the son of Bhrigu, propitiated Varuna Deva (the Lord of the Seas) to get some land for himself. He threw into the sea the axe which Paramasiva had given him with his blessings. Thus he raised the land from the sea and gave it as a gift to the Brahmins according to the rules. This land came to be known as Kerala. That piece of land was not habitable because of the salinity. Not even vegetables grew there. People began to leave the place. Bharghavarama was pained at this. He undertook penance to please Lord Siva, who advised him that the objective could be realized only if the flaming poison of the serpents was spread everywhere and that the only means of doing that was the worship of Nagaraja. Parasurama, a Yogi, firm of will and above all desire, decided that he would take no rest until he saw Kerala come up as a land of evergreen beauty full of trees and plants, prosperous in every way. He set out with his disciples in search of a deserted jungle in order to please Nagaraja who was inaccessible and beyond anybody's understanding. He found a suitable place near the seashore in the southern part of Kerala. Satisfied with having found a proper place for the realization of his cherished dream, the great Rishi constructed a Thirthasthala for the performance of penance. Bharghavarama, a partial incarnation of Lord Vishnu, had to undertake very severe penance.
" The unspeakable splendor of millions of moons! The bright magnificence of emeralds stuck to the hoods. Golden jewels made attractive by miraculous embroidery! Lotus feet worshipped by crowds of Gods! Brilliant beauty of form, full of youthfulness!". Parasurama prostrated at the lotus feet of Nagaraja and prayed to realize his objective. Nagaraja granted his request with great pleasure. Ferocious serpents arrived at the spot at once to spread the flaming Kalakuda poison. Because of the percolation of poison, the land of Kerala was desalinated, to become habitable with envious greenery. Parasurama then requested the Lord to bless the land forever with his eternal presence, and that was also accepted by the kindly-disposed Nagaraja. At a very auspicious moment Bhargavarama, the supreme devotee, installed, according to Vedic rites, Nagaraja, who is Brahma, Vishnu and Siva in one in the 'Thirthasthala' (Hall of pilgrimage) filled with Mandara trees, the place now known as Mannarasala. (The installed deity here represents Anantha (Vishnuswaroopa) and Vasuki (Siva in spirit). The installations of Sarpayakshi, Nagayakshi and Nagachamundi, the Naga deities, as well as of their associates were conducted in the proper places with the proper rituals. Parasurama performed to the accompaniment of Vedic recitation and singing of Sama, Abhishekam, Alankaram, Neivedyasamarpanam, Neeranjanam, Sarpabali and other rites pleasing to the serpents and thereby made all the serpents happy. Parasurama brought learned people from other religions; installed Durga and other deities in different places; appointed Brahmins who were Thanthric experts for performing poojas; nominated Kshathrias, peasants and the Ashtavaidyas who were supreme among the physicians; thus he brought Kerala, filled with beautiful vegetation and to prosperity. After giving important instructions to be followed to preserve the sanctity of the place, Parasurama left to do tapas on Mahendra Mountains. Many generations passed by. The family fell into the grief of childlessness. Vasudeva and Sreedevi were the sad couple who had to bear that heavy load of sorrow, who resolutely worshipped Nagaraja to allay their grief. It was about this time that unexpectedly fire broke out in the jungle around the dwelling place of Nagaraja and burnt down the jungle. The serpents were tortured by the flames, forcing them to hide in their pits with great difficulty. Vasudeva and Sreedevi looked after the serpents, who had their hoods charred, bodies half-burnt, and fainting from time to time, falling down and crawling along. They gently fanned them with fans made of sweet-scented grass and poured ghee mixed with honey and oil on the wounds; cooled their melted bodies with sandalwood ointment; and comforted them. They put them at the foot of banyan trees. They performed purification ceremonies and consecrated the pits; and were put up in special places under the shade of deodar trees and in Chitrakudas. The couple performed abhisheka with thirtha like Panchagavya (a holy mixture of five items from the cow's milk, curd, butter, urine and dung); observed elaborate poojas according to rules with areca nut flower bunches, fragrant flowers and water, incense etc., Nivedyam with melted butter (ghee), milk, payasam with molasses, rice powder, turmeric powder, coconut juice, Kadali fruit, cow's milk, all mixed together in the proper form as Nurum Palum, equivalent to the elixir of life. They offered serpent deities with great devotion, appam, aval (beaten rice or rice wafers), tender coconut etc. They chanted vedic mantras, performed circumambulation and performed all kinds of poojas to restore those crowds of serpents to full health. The omnipresent and omnipotent Nagaraja was greatly pleased with their continuous penance and the love shown to his associates; Nagaraja made himself visible to the couple and blessed them that he would incarnate on the earth as their beloved son. He said " I shall assume the form of a serpent and stay here (in Mannarasala) permanently, as long as the sun and the moon are there, showering prosperity on your family and granting protection to all the devotees who come here …". 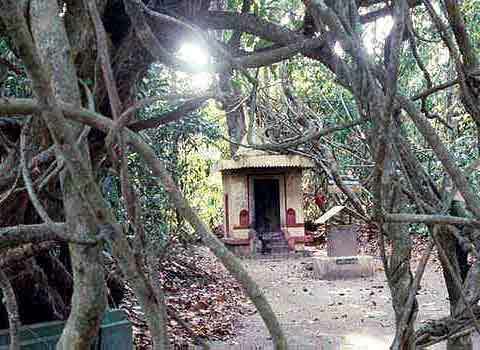 Thus Mandarasala, the place filled with Mandara trees, the holy spot where the serpents got shelter, where the earth was fully cooled, became Mandarasala. The boon came true. The Brahmin lady became pregnant and gave birth to five-hooded serpent-child as well as a human child. The two brothers grew up together. Initiation ceremonies and Vedic education were carried out at the proper time in the traditional style. Nagaraja instructed the younger brother to enter into matrimony for the perpetual reservation of the holy family and he obeyed it. When the five-hooded Nagaraja realized that the objectives of his incarnation were realized, he informed the Holy Mother that henceforth he would live at this Illam by entering into Samadhi to bless the devotees. Then he suggested certain inviolable rituals and rules for offering worship and then went into the immaculate cellar and vanished. (It is believed that even today that five-hooded Nagaraja stays in the cellar doing Tapas for the abound prosperity of his dependents. The members of the household always refer to him with great respect and devotion as "Muthassan' and "Appoppan" (Grand father). The jungle close by is the exclusive preserve for his unobstructed peregrinations (Appoppan Kavu - Grandfathers' Grove). In the light of experience, many devotees who have experienced and heard about the miraculous powers of the serpents and the presiding deities here, tell many stories about Mannarasala temple. It is not a rare thing to see the same serpent appear in the same location for a number of days in the temple premises. On the steps of the gatehouse, on the hedgerows, among the creepers; those who perform bhajanam in the temple can stand very close at any time and pray. On one occasion, about six decades ago, a fierce yellow serpent started dancing on the eastern bank of the holy pond near the Appooppan Kavu carrying an evil snake in its mouth. Then it vomited the evil snake and released it. The serpent raised its hood either out of fear or out of a desire of revenge. The fierce snake with a sense of humour swallowed that cobra again. The late Valia Amma came to know about it. She came to the spot with tears in her eyes and spoke a few words. The serpent did not budge. This drama lasted for half an hour. Amma became sad. 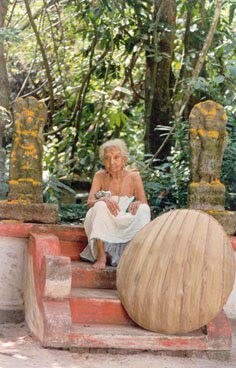 With the chanting of manthras, she prayed for the release of the cobra. No more delay, the serpent left the cobra, bent down its head and went straight into the Appooppan Kavu, as if nothing had happened. The nature of the yellow snakes of Appoppan Kavu is beyond description, and is wonderful. When Sri Chitra Thirunal was ruling over Travancore; the destruction caused by World War II was spreading all over the country, the people were oppressed by poverty; there was famine everywhere. Sir.C.P.Ramaswamy Iyer was the Diwan, a man of great intellect and formidable prowess. Orders were issued to take over foodstuff from any household, even if they are in the custody of the great ones, and to introduce rationing. The Tahsildar of Karthikappally at that time was a Tamil Brahmin; a native of Haripad; his house was very close to his office; a gentleman who knew exactly the income of each individual and family in the locality. He was waiting for an opportunity to please the Diwanji. He got ready to display his skill to the maximum. Among the list of landlords the Mannarasala Illam was included. One day very early in the morning the Tahsildar and his associates came to the Illam along with a batch of policemen. They took away every grain of rice and paddy, even what was meant for Nivedyam. Everything was heaped in the courtyard. He was disappointed at not being able to collect as much rice and paddy as he had expected and it made him indiscrete. He knew very well that no one would enter the Nilavara. He issued orders to open the doors of Nilavara on the suspicion that foodstuff had been illegally stocked there, without heeding to the requests of the family members not to open the Nilavara. No one came forward to do so, including the accompanied policemen. The infuriated Tahsildar under a false sense of prestige opened the cellar. But he could not enter inside and had to retreat. (No great delay; he lost his eyesight and his family which had been rich was reduced to penury and destroyed. He was completely broken and had to sell off whatever left; and had to leave the place forever ). The officers came with their men to take away the rice that had been heaped in the courtyard. On the top of that heap, a serpent was seen; and the policemen were frightened. They approached the head of the family for help. He advised them to take away everything leaving behind what was meant for nivedyam in the temple. They were ready to do so; and the serpent slowly crept away and disappeared into the jungle nearby. There is a tale that has been well-known from ancient times depicting about the consequences for trying to enter the Nilavara, except by the Great Mothers from time to time. A few days after Anantha the ‘Muthassan’ disappeared in the Nilavara, his younger brother had the desire to meet his brother. When he insisted obstinately, the mother said “ Then, enter the Nilavara and close your left eye and look at the south-west corner with your right eye…”” The son followed it and saw a brilliant light. The eye that saw it lost the power of sight! It is interpreted that the main characters in this tale, the Mother and the younger brother could have been the Valia Amma and son of a later generation, and that it may perhaps have happened. A young boy of the family may have felt the desire to see the “Muthassan”, and the Mother may have yielded to the unlimited obstinacy of the son. That mother by divine insight must have realized that he might lose eyesight because of the halo of light; hence she may have advised him to close one eye and look with the other eye. And in this way he might have lost the sight of one of his eyes because of the flaming brightness of the light. Legends say that Anantha, was born as a five hooded serpent-child to Vasudeva and Sreedevi of the Illam. Once the aims of his incarnation were fulfilled, he informed his mother that he would remain in the Nailavara in Samadhi forever, blessing the devotees. (More details in History – Muthassan, Appoppan Kavu). The Mother who was so full of affection could not put up with that separation. Human weakness pained the Holy Mother. She rushed into the cellar herself; there shone only a halo of light… The Lord had his hermitess Mother as the one and only centre of confidence in this world. The beloved son consoled the Mother. Only the Mother was granted the opportunity and authority to see the Lord face to face; he gave his full consent to be satisfied with the Mother’s offering of worship just once a year. (Still Nurum Palum is offered only once in a year, the day next to Sivaratri by the Great Mother). He also revealed the secret truth that the worship in the cellar need be offered only by the Mother and the worship offered in the temple will reach him without any loss of time, with the same force. Thus he gave his beloved mother the unusual permission to offer worship in the temple as well as the rare opportunity ever granted to an antarjanam (women) priestess. Uruli Kamazhthu in Nilavara (offering of traditional bronze vessel) is one of the most popular devotee offering in Mannarasala. Known for begetting children to couples, thousands of people come here to carry out this sacred and rare offering to Nagaraja. According to Mannarasala temple sources, there are certain strict rituals to be followed for this offering. It is advisable only for married couples who have not been able to have children for years, since their marriage. The couple should come to the temple and pray to the God for his blessings. Receipts for the offering have to be taken from the administration office. Offering includes a bronze Uruli that can be used to cook at least a score of rice, a Nilavilakku (bronze lamp), garland etc. In the presence of the temple authorities, the couples should offer the Uruli with its mouth upwards in front of the Nagaraja shrine after three rounds to the mannarasala temple with due prayers. An offering have to be given to Sarpayakshi as well. After Pooja, Valiamma will take the Uruli to Nilavara and it will be kept there with its mouth downward, which will be opened only after the couples get a child. Expenses for this offering are charted in a way to offer at least two Kadali fruits every day to Nagaraja, for about one year. Once the couples are blessed with child, they should come to the temple with the child for prayers. They should submit either silver cradle or a miniature baby in gold or a miniature divine serpent in gold to the Nagaraja, in accordance to their financial abilities. Then Valiamma will open their Uruli kept in the Nilavara after due prayers. According to temple sources, devotees can source all that are required for this offering from the temple administration office at nominal costs. Normally more than 5000 Urulis are offered in a year at this temple. The most celebrated festival at Mannarasala is the Ayilyam of Thulam. In the beginning, the Ayilyam of Thulam had no speciality or importance. 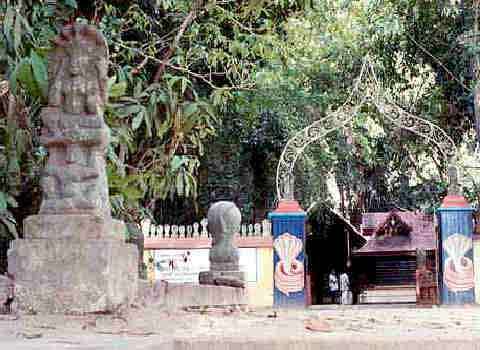 It was a regular custom for the Maharaja of Travancore to visit this temple on Ayilyam day in Kanni. On one occasion, the Maharaja could not reach the temple as usual and had to postpone the visit to the Ayilyam day in Thulam. The royal palace met all the expenses for the celebrations of that Ayilyam. Several landed properties were given away to the temple free of land tax in order to make the festival more attractive, as an expression of repentance. Thus the Ayilyam of Thulam came to secure a royal splendor and official glamour without difficulty. The Ayilyam days of Kanni and Kumbham are still celebrated with befitting grandeur. 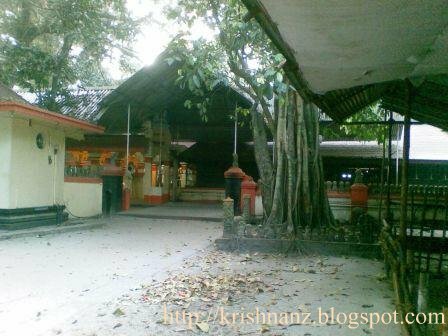 Ashlesha Bali Pooja can be performed in this temple.